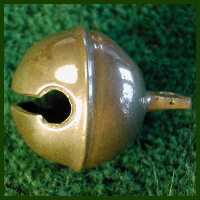 The round-ridge bell design, probably a variant of the classic petal bell, first appeared in the mid 1800s. 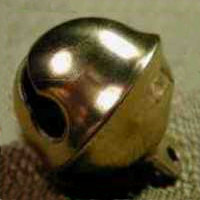 Although we coined the nickname "round ridge" to describe this bell, the original manufacturers called it a "rim" bell. Unlike the petal bell, a round-ridge bell has a completely smooth surface with no decorative designs. This makes the round-ridge bell well suited to being polished to a mirror-bright luster or plated with shiny nickel. Occasionally we find, in a strap of round-ridge bells, an identically shaped petal bell with its petal design so faint as to be nearly invisible. It seems likely that some petal-style molds may have been modified when fashion decreed that plain, brightly-polished bells were "in". Round-ridge bells are generally 1 to 2 inch in diameter. They are most often attached in a single row or multiple rows along a neck or body strap. Left: Classic round-ridge bell about 1 1/8 inch in diameter with drilled-shank base. 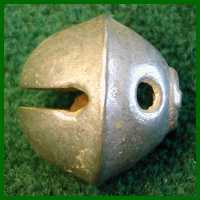 Middle: Nickel- or tin-plated bell about 1 1/4 inch in diameter with rivet-style base. Right: Another style of round-ridge style with a smaller ridge than bells shown at left. Bell is about 1 inch in diameter and has a drilled-shank base.